Home > Latest News > Britain’s oldest Toyota Carina E found! Here it is – we’ve finally tracked down one of the oldest British-built Toyota Carina Es still on the road in the UK! Our search for the earliest running example of the first model made at the Toyota Motor Manufacturing UK factory in Derbyshire gained huge exposure – and after chasing down leads, we’ve located the one of the earliest Carina Es still on the road. Mike Hoyland’s Carina E was registered in July 1993, and was built during our Burnaston factory’s early months. December 16, 1992 was a groundbreaking day for Toyota. It marked the first day of Carina E production in the company’s state-of-the-art factory in Burnaston, near Derby. Not bad, considering the decision to build here was taken just three years before, with Toyota Manufacturing UK (TMUK) being set-up in December 1989. It’s an ongoing success story more than 20 years on, with TMUK’s investment now topping £1.4 billion. In 2012, 109,502 Avensis and Auris models were built there by a dedicated and expert workforce. The Carina E was launched in the UK and Europe in March 1992, but for the first nine months, cars sold here were actually imported in from Japan. Despite that, Toyota called it the ‘E’ to denote that it had been tuned to appeal to European tastes, and to reflect its eventual UK production. 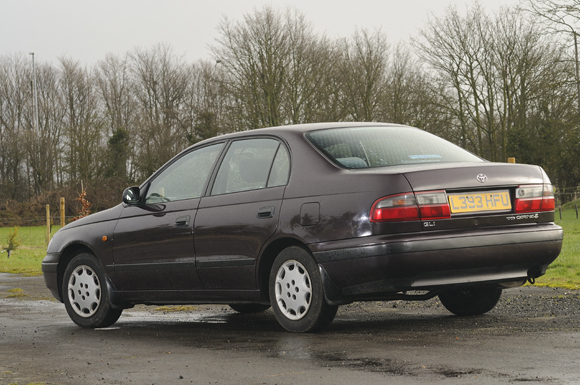 Once on sale, the Carina E soon started selling strongly – both on the back of the memorable advertising campaign (that featured Enya’s Book of Days), and the brilliant strapline, ‘the car in front is a Toyota.’ 20 years on, people still say that. It’s possible that Mike Hoyland was humming that Enya song when he walked into his local Toyota dealership with a view to buying one. It was July 1993, and he decided that he wanted a new car to replace his trusty Honda Accord. He’d worked hard for it, too: ‘I had taught chemistry for 30 odd years, and decided to buy one using my redundancy money,’ he says. 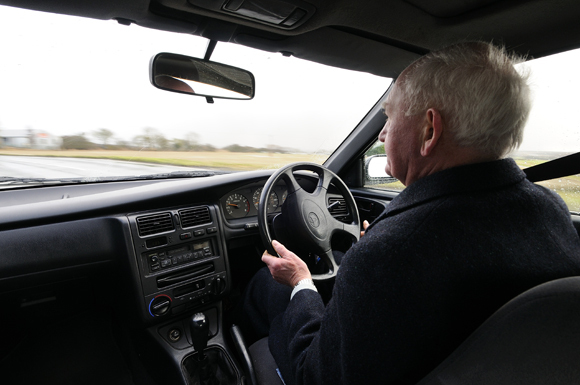 The car Mike went for was a Carina E GL four-door saloon, which came up to the princely sum of £13,175.00. ‘I still have the original invoice, and I let a friend adopt the Honda, so there was no trade-in against the Carina.,’ Mike smiles. Needless to say, Mike took delivery on 1 August – L-registration day – in order to maximise that new car experience. And coming up to 20 years on, Mike still has that Carina E. And he loves it. ‘It has been absolutely reliable, he says. ‘It runs almost silently, and the exhaust has only been replaced once. At 32,000 miles, the Lambda sensor packed up, but I was advised to contact Toyota GB headquarters in Redhill, which I did. And without any query, they agreed to stand the cost.’ Other consumables have included one starter motor, a shock absorber, and a couple of radiators. ‘But that’s all not bad for 20 years and 153,000 miles, eh,’ Mike smiles. Did Mike buy the car because it was made in the UK, or because it was a Toyota? ‘I hadn’t realised it was one of the earliest of the cars made here, although there was a small label to that effect somewhere at the top of the windscreen,’ he confirms. He’s also a Toyota fan. ‘The company is supportive of its cars and the customers. My favourite cars are the final-shape MR2, the old Celica and the new GT86. Back to reality, the Yaris Trend looks great, and what I’ve heard concerning the Auris is also good. But if money is object, then a Lexus GS would fit the bill perfectly,’ Mike says. Sorry thats meant to be P984MAK! Unfortunately this part is no longer available from stock or production. We therefore cannot offer any assistance in supplying a replacement part. A third party company may be able to repair the part, otherwise it may be possible to source a spare part from another vehicle. Unfortunately your Toyota Centre will be unable to assist in supplying this part. We wish you many more happy miles in your Carina E.
I have an immaculate N reg Carina E 2000 CDX Auto 96000 miles for sale. My first car, K150 SGE passed down from my dad…approx 97k miles and still going strong till I wrote it off on the motorway, damn oil spillage…was still running even after colliding with the barrier!! Great car!! Thanks for getting in touch. We love hearing about customer’s vehicles. We hope you get your car back on the road soon! Amazing Jnr! We love seeing our customer’s vehicles. We’d love you to share an image with us on our social channels! This is great to hear. Do you have any pictures of this iconic car? My wife has a “K” registered 2.0 litre GLi automatic with 145000 miles on the clock. This is great to hear. Also, you are 5,000 miles away from being able to join our elite High Mile Club. You can find out more information here: https://blog.toyota.co.uk/high-mile-club. I have a toyota e 5 door hatchback 1.6 petrol 16.v 5 gear in turquoise registration 14.8.1992 any oider ones out there. That’s great to hear. We love hearing stories about customer’s vehicles. Feel free to share an image with us on our social channels! Thanks. I had a November 1993 Carina-E GTi a few years back – L980 VJC. Sadly I’d only had it a week and someone wrote it off. Great cars though. My dad had a Japanese-built 1.6 GLi which was August 1992 registered – K212 PPV. We’re sorry to hear that and we hope you managed to get your Carina-E GTi fixed up. Thank you for your kind words and your love of Toyota. Thanks. 2.0 Gti did magic for people in the late 90’s early 00’s :):) super strut brace suspension. That meant to say carina E.
That’s great to hear. We wish you many more happy miles ahead in your Carina E.
Hi all, I get this car from my uncle. I will be third owner. It is toyota carina E 1.6 78kW from year 1997. I think, that it is great car, because it has 500,000 kilometers in tachometer and engine still running like clock. And my uncle never had some hard problem with this car. Its only one mistake is low protect for corrosion. Thank you for your kind words. We love hearing customer stories and we wish you many more happy miles ahead. Thanks. Hi all, have just found this blog, I have just bought a Toyota Carina E XL SALOON. 93000 miles and in great condition inside and out, registered on 31/03/1993 in red. so very close to the oldest found so far.2 owners from new, last owner had it from 1995 . I have not even used it yet, front downpipe to do this weekend and will be on the road by Monday. could not resist buying it when I saw it!!! I too own a Toyota carina 1.8 GLS 1995 reg it’s now done 300 000 miles and still running fine. Thanks for your comment. We love hearing owners stories of their cars. Also have you considered in joining our High Mile Club? You can find out more information here: https://blog.toyota.co.uk/high-mile-club. Unfortunately, there is no way of us knowing what the mileages are for other Carinas. Many thanks. My wife currently drives a 1992 Carina 2.0 ltre GXL automatic which she has had for over 24 years. Current mileage 82449 from new. Top of the range, elec sun roof, windows, mirrors, has never let her down in all that time. When bought we were informed it was one of the last models from Japan before starting manufacturing in UK at Derby. Have tried to obtain a value but to no avail, can anybody give me an idea of price we should ask for this white model in super condition. My wife has a Carina E GLS Automatic registered on 25th March 1993. It is still running well. Is this the oldest one still running? Thanks for getting in contact with us. We’re delighted to hear about your Avensis. It does appear that your car is now the earliest UK-built example we know of. After publishing the results of our initial search (the post you commented on), we subsequently found Avensis models from July 1993 and a further three from May 1993, one of which we purchased to add to our growing heritage fleet (link below). I have a 1997 on a P, 60k on the clock. Saloon in blue metallic. 7AFE engine. Near perfect. Time to sell now. Hi I got carina Gti such a amazing car the best carina is to buy GTi try it. It has been nice to hear about lot of people having had such a good Carina`s experience as me. I have a Carina E 2.0 GLI, bought in Spain in 1994. Almost 22 years old and the only breakdown has been the alternator that spoilt the battery and the water temperature´s sensor, and a radiator. But the best is its sound. Incredibly as it may seems, the engine continues working as silently and accurately as the first day. I have to say that some people make jokes about my “hystorical” car, but I really know they are green with envy about my Carina´s reliability. We have one a 1995 Carina E still on the road. M404JTG full MOT never failed one. A bit rough around the edges and a broken wing mirror. Runs like brand new. Amazing John! We love to see our customer’s vehicles. We’d love you to share an image with us on our social channels! Hope I can find a good home for my Carina e as its been amazing it’s running so well seems wrong to take it to a scrapyard but have a great deal on a car from my brother thinking about getting a full MOT in August then selling or let it go for 200 sure it will pass email me for more info they are so reliable probably get newer car and wished I had kept me dear old Carina e me first car what a dream car someone come and take it and give it a new home . Carina E, 1.8GS P Reg. Mink body work and interior. 2 owners from new. 60k and full Toyota history till then. West midlands. In a light metallic blue. My 1996 P Registered Carina E, in fantastic condition has only covered 62000 miles and has had only two private owners. Hi ,everybody and Carina E fans .My Carina E Hatchback is from 1995 and has about 223 thousend miles on the clock. She just has passed the Rep.Ireland nct (mot) with no problemes at all.The car is in good shape and drives like a new one. I’m searching for a carina anyone thinking of selling? Hi Ben, carina e failed MOT emissions test, 1992 Sept model. In good condition otherwise but left standing so battery now flat. Can send u pics and other info if interested. My Dad bought the car from new and gave it to me in 2006 when he had only months to live, I had it until last May, then gave it to my ex-husband, it’s now back sitting on my drive and he has asked me to find it a new home! Obviously car has lots of emotional sentimental memories so want to ensure it goes to good home. I am selling my Carina E 1996 on a P plate. 61000 miles. Saloon, 1.8 GS. Hi did you get carina e I have one regards Michael. Yes we are please get in touch . Using Mother-In-Laws 1995 Carina E – Just done 111,000. Still in good shape, but woek this morning and the sunroof glass had all shattered! Having nightmare to try and find replacement under £300! Insurance won;t cover it. Any ideas guys? Thanks so much. Thank you for your post. We are glad your Carina is still in good shape and performing well and we are sorry about the sunroof. We would advise visiting your local Toyota Dealer who will be able to help by sourcing parts for you. Your local Toyota Dealer can be found here: https://www.toyota.co.uk/world-of-toyota/find-your-dealer.json. Hope this helps and if you have any more questions please let us know. Thanks for your post. Great to here about your Carina and the mileage you’ve covered. We also appreciate hearing from owners with stories about their car. We would love to see a picture of your Carina on our Facebook page. Diesel D-TURBO G.S was the one! 96/97 models amazing beasts!! We suspect you might be running a late model Carina E here . . . . I own an M-reg Toyota Carina E 1998cc automatic which I inherited from my late father ten years ago. It had been lovingly cared for and I had tried to follow suit. It is just about to top 200,000 miles and it drives like a new car. Half of this milage is my own. It now needs a new hydraulic control unit which will be the first big money I have had to spend on it. I hope I can still get the part! My engineer has tried to tempt me to update my motoring machine, but I don’t want to know. Why throw away a car that is in near spotless condition? What a waste! 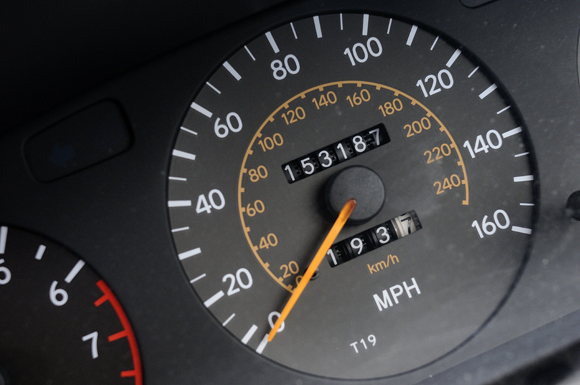 It was great to hear about your experience of Toyota ownership and the mileage you have achieved in your Toyota Carina E. We hope that you are able to get your control unit fixed and if you do need any further help or advice then we recommend that you contact your nearest Toyota dealer for further advice. I have an older one – J460MCM – stilll running with 97,100 on the clock. Does over 57 mpg & around town does 40 mpg. Toyota Carina e Gli 1.6. Full service history & only off the road 10 days since 1992 for repairs! Hi John, thanks for taking the time to contact us. It’s great to hear your Carina E is being looked after and cared for so well. We’d love to see a picture, feel free to upload one to our Facebook page (Toyota UK). Thanks again for getting in touch! I’ve had my 1993 Toyota Carina E Automatic for 10 years. Just passed the MOT with 215,000 miles on the clock! Hi Paul, that’s great to hear! We’d love to see a picture of your Carina E, feel free to post a picture on our Facebook page (Toyota UK). Thanks for getting in touch, we wish you many more happy miles to come in your 1993 Carina E :). I don’t do Facebook but have joined Toyota Owners club and posted pictures of my car in new members section (Robens). Came across this site whilst looking for a valuation for a Toyota Carina E XI registered in May 1994. My mother-in-law has the Carina and at the age of 80 with some health problems she is unable to drive the car and has offered it to my 23 year old daughter. Unfortunately the insurance for the car is what I would think is several time more than the car is worth. Additionally, the car is a little large for what my daughter would like, hence why we are looking to sell the car on behalf of my wife’s mother. The car is in good condition, an MOT for 10 months and serviced regularly, has 66K miles on the clock. Could anyone suggest where we should look to sell the car? The car is in Leeds and has been in the same family for the last 20 years. It was great to hear about the Carina E which has been in your family for the past 20 years and we hope it has served you well. In terms of advice of where to sell, it may be worthwhile talking to your local Toyota dealer in case they are aware of anyone ion the area who is looking for a Carina E. Other options might be contacting the Toyota Enthusiasts Club in view of the long standing history of this car. They may also have further contacts for you. Finally you do have the option of several large second hand car websites if the above two suggestions do not come up trumps. By the sound of it though it could sell quite quickly. Thanks for your post Andy and great to hear your experiences about working on Toyota cars. Once a petrol head always a petrol head! I bought the car as new in May 1994 and have been the sole owner since then. I am more than pleased with the service that it has given.over the past twenty years. Thanks for your post and for taking the time to tell us about your Carina E. It is quite a story being the sole owner since 1994 and we are delighted that you have been pleased with the service and your Carina E over the years. The earliest UK built car we found was on an L plate and was still going strong and we hope that all is ok with yours. Feel free to post a pic of the car on our Facebook page so we can check it out. In the meantime thanks again for letting us know. I own 1993 Carina e 85,000 miles in Kampala. Love it and is still great save for big sound and 1000 rpm idling revs. Can anyone kindly advise tip to correct high idling rev problem ?. We’ve passed this by our technical team and as we’re sure you will appreciate, it’s very difficult to diagnose this problem online. Hope this helps and sorry we couldn’t be of further assistance. Easy. Just done mine. You need to remove and clean the Throttle body and IAC Valve. I got some Wynn’s Carb Cleaner from Euro Car Parts. Common fault on these. Mine was idling at 1200, as soon as I cleaned the Unit and added new gasket and ring, back down to 850. Ours is older registered 31st march 1993. Still in regular use. Sb153abk002703. I have a 1992 k reg!! Thanks for your post and it’s great to hear of your ’92 Carina. You can check if your Carina was British built by looking at its 17-character VIN plate, more details as to how you can locate your vehicle’s VIN can be found here: http://po.st/Sk47Ee. If its VIN starts with ‘SB…’ your vehicle was built in Burnaston, UK. We’d love to hear more, it certainly sounds like your Carina could be one of the oldest British built! We have a white one registered August 1993 with 88000 on the clock still runs great. Great to hear about your Carina E.
After its second annual service, around 42,000 miles, it returned from the Toyota dealer and, whilst operating correctly, it now was returning only 30mpg or less. Later, the MIL lit and eventually both the air temp sensor and the O2 sensor (lambda probe) were changed and ECU re-programmed. However, the car still only returns mid-twenties mpg. The car runs very well in all weathers, has good engine compression, has new oil, air and fuel filters, and fluids, no leaking lines and no obvious ignition, fuelling, bearings, brakes or tyres problems, it just uses 30 percent more fuel than it should…we’re now at 75,000 miles and it’s still a great car but it’s time to sort it – any ideas ?? Thanks for your post and history regarding your Carina E.
We have run this query past our technical team who have suggested taking this to your nearest Toyota dealer for diagnosis. In terms of suggestions for you though, they would recommend inspecting the catalytic converter on your car. They have also mentioned that a drop in fuel consumption can also be attributed to engine wear over the years. “A11 EEC” was the very first UK built car off the production line – I know as I was tasked with running it in for 1000 miles before it set off on a “round UK economy run” to show the low fuel consumption from its lean burn engine. Appreciate the information. Always good to learn know more about vehicle history. The irony of the add campaign was the Carina in the film (reg no. A11 EEC) was in fact a Japan built car. cleaned,also replaced injector 2 but still misfires after it heats up,runs fine until it heats up,any Help would be appreciated. Thanks for the post and sorry that your Carina E is causing you a few concerns. It is always difficult to diagnose problems without seeing the car and our technical team have suggested checking the head gasket to ensure water is not getting in the engine. Ultimately though, we would recommend contacting your local Toyota dealer as access to he vehicle would be required to ensure correct diagnosis. You can use this link to access your nearest dealer. http://bit.ly/16WmR5P. Replace all the injectors(yellow colour produced by Hella) with black-silver ones(japanese).Had the same problem at 190000 Km. Thanks for your post Gnikas. However we would still always recommend that diagnostic work is undertaken by a franchised Toyota Centre to correctly diagnose a fault. HI….my Carina e is still going after 257,790 miles!! I love it but need new speedo needle!! Mine is L92 HNK and I think it was nov 93 or 4…..It had done 80.000 miles when i got it. Many of the miles have been driven on the M6..it likes speed. I have a j reg 1.6 auto registered in January 1992 same shape as above, its done 163k and runs like a dream I do 80 miles a day in it, it just sailed!! through a mot. My dad bought a new one in 1994, also build in the UK. It still runs great, having around 80.000 miles so far. Original exhaust and original owner. The UK made Carina is a quality car, like the Japan made. You can check where your Carina E was made by looking at the beginning letters of the VIN number. For example, the 17-character code on the VIN plate starts with an S for Burnaston (UK) built vehicles. ONLY 150K on the clock?! I have one that’s three years younger than this, and with 213,500 up, it’s still running as well as it did when I took it for a test drive nine years ago, and that was after seven previous owners. Anyone I encounter who has had any dealings with this iconic car tells me to “keep it till it dies”. The way it’s going right now, I think that’ll be quite some time away yet! Thank you, Tony, it certainly sounds like it’ll be running well for some time to come yet! The Carina E was built in both the UK and Japan. In December 1992, the first Toyota Carina E was produced at our factory in Burnaston, Derbyshire. The VIN number of a Carina E identifies where it was built, if it begins with an ‘S’, it was built in Burnaston. If it begins with a ‘J’, it was built in Japan. Thanks for your comment and we hope this helps. Thanks very much for that info. I never realised they were Japanese imports. My father did have a 1995 Carina E from new which would gave been a Burnaston built car. While it gave a lot of mechanical trouble the local dealership, Toyota IRL and factory engineers went out of their way to right every wrong. Myself and my father (now sadly passed away) both had many Toyota since and enjoyed the great after sales care from Toyota. We’re so pleased to hear of your family’s loyalty with Toyota and the After Sales care received during this time. If we can ever help you in any way, please do let us know. My uncle has a 1.6gli 4 door carina e in atlantic blue. Only done genuine 20000 miles with fsh. Registered 31.5.1993 on a k plate. serial umber SB153AOL00EOO7531. Is this one of the oldest Carinas on the go. Drives as sweet as new. Thanks for the post Tony and we can see that this a UK built Carina E.
Thank you for taking the time to post. Great to here about your Carina. We really appreciate hearing from owners with stories about their car. We would love to see a picture of your Carina on our Facebook page (Toyota UK).